Mueva Fitness in Clarkston is partnering with Pingree Farms and Independence Township Parks, Recreation & Seniors by putting a unique spin on the ancient practice of yoga. 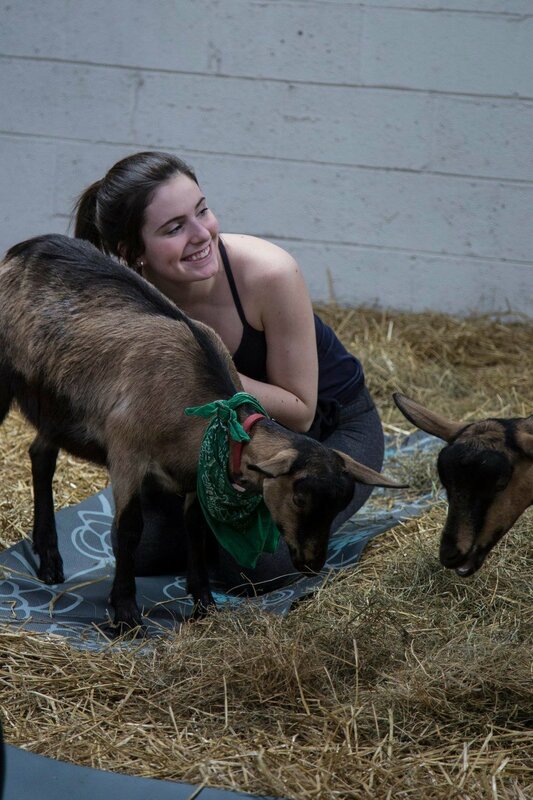 Goat yoga is a unique experience that blends the movements and stretching of yoga with the playful antics of live kid goats. Try the “downward goat” or “stretching kid” poses. All you need is your mat, a sense of adventure, and a water bottle – we will provide the rest. Space is limited; so register TODAY! Classes are taught by certified yoga instructors and call this particular class an "outward practice" instead of an "inward practice." Normally, in yoga, you're about clearing your mind and this is about experiencing what's outside. 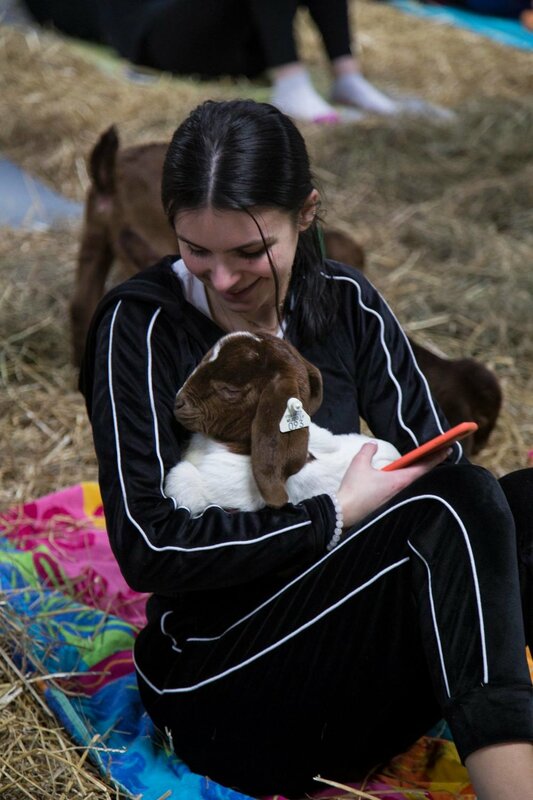 Take in the beautiful scenery, meet some interesting folks, and enjoy snuggling these adorable goat babies. Pingree Farms, located in the City of Detroit turns vacant and blighted land into an urban food oasis while providing meaningful educational opportunities for Detroit’s young people. Each spring a group of 60+ volunteers, factory workers from Milton Manufacturing who own the property along with the owners, and neighborhood residents plant thousands of plants that grow to yield fresh food for the surrounding neighborhood. Pingree has also worked with 4-H and the Detroit Public Schools to develop programs for learning about caring for animals, growing food and envisioning a better world. Ready to join us on the beach? Every other week on Sundays this summer, our studio relocates to our quaint beach in the Village of Clarkston where you'll awaken your mind and senses while breathing in the fresh air that is Pure Michigan. Whether you are an experienced yogi or just looking for a relaxing experience, this class will help you feel at peace with nature through movement, breathing, and meditation. This is an all-levels class; no prior yoga experience necessary. Bring a yoga mat or beach towel, sunscreen, a light jacket, and bottled water. Class will be held at 6465 Dixie Highway if we have inclement weather. Participants must be 12 or older (minors accompanied by adults). High school or college students (24 or under) or seniors aged 62 or better for discounted ticket. Please be prepared to show school ID or drivers license for seniors. In Partner Yoga, we practice yoga asanas (poses) together. Our lives are so busy and stressful that we forget to take time out to simply relax. Quality time with your loved one is often the first thing that is neglected. Create a loving space for each other as you move together and breathe as one. Join Barb Gilbert, Mueva yoga teacher and her sweetheart, Mark for 75 minutes of this playful and intimate class. This is an all-levels event and no prior yoga experience is necessary. $30 per couple. Space is limited to first 20 couples who sign up. Bring two yoga mats (or rent for $1 each), wear comfortable clothing, and a water bottle. Overcome gym intimidation in this 3 hour hands-on workshop lead by our fitness professionals that will give you everything you need to know to crush your 2019 goals with confidence and power. You'll leave this workshop able to join any group fitness class with the knowledge, tips, and advice to be self-assured and feel appreciative for your body and your abilities. Zumba® Fitness moves the World and we're excited to be bringing you Sharif Faranca from Cairo, Egypt to share his passion and love of Arabic culture and dance with us. Known throughout the Zumba community as "Shrek", Sharif's dynamic and charismatic personality makes for a Zumba experience unlike any other you've ever experienced. Using the ancient traditions of Oriental dance including bellydance, Bollywood, and Egyptian folklore rhythms mixed with Hip Hop and other dance styles, you'll sway your hips, body roll, and have fun exploring this sensual, playful, and rich dance style. But don't worry, you'll also break a sweat and get the energetic workout that Zumba Fitness is known for. Check out Sharif in action and if you look real closely, you may even spot two instructors you already know and love. Ready to join us on the beach? Three times each Summer, our studio relocates to our quaint beach in the Village where you'll awaken your mind and senses while breathing in the fresh air that is Pure Michigan. This is an all-levels class; no prior yoga experience is necessary. Mueva Fitness in Clarkston is partnering with Pingree Farms and H.O.P.E. Horsepark by putting a unique spin on the ancient practice of yoga. 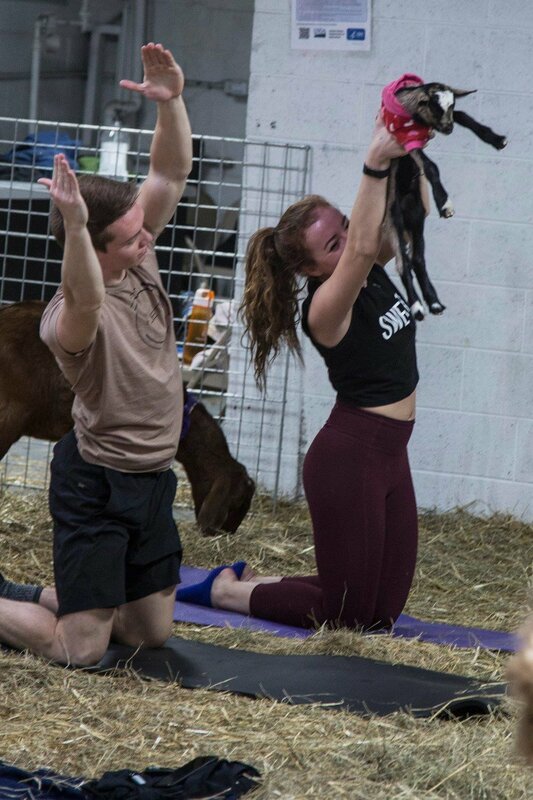 Goat yoga is a unique experience that blends the movements and stretching of yoga with the playful antics of live kid goats. Try the “downward goat” or “stretching kid” poses. All you need is your mat, a sense of adventure, and a water bottle – we will provide the rest. Space is limited; so register TODAY! If the cuteness isn't enough to get you in, part of the money raised goes toward growing H.O.P.E. Horsepark's mission to help heal others by bringing them back to nature, using the healing power of horses. Primarily a sanctuary that offers horses and ponies a second chance in life, most of H.O.P.E. 's herd is rehabs. H.O.P.E. 's philosophy is not to teach how to ride only, but to teach how to care for all conditions in the lifetime of the horse. Dust off those dancing shoes and come dressed in either athletic wear or vintage attire for the ultimate Swing Dance Party with VIP dance instructor Dennis James. Arrive by 7 for a dance lesson and learn the basic steps, including underarm turns, kicks and flicks. Stay after for your favorite classic cocktail (BYOB) or non-alcoholic libation provided along with eats and fun big band music and open dance floor. Time to party Zumba style with special guest Marius Padieu (the Zumba King) and your hometown heroes Downtown Lisa Brown & Mama Tee Farough. Burn off those Cadbury eggs and melt those bunny ears during this two hour dance fitness class full of sweaty Zumba fun. Everyone is welcome; ages 12 and up. No dance experience necessary. We love newbies! Space is limited so sign up early and spread the word. If you've heard about all the physical and mental benefits of yoga and are curious to see what all the buzz is about but don't want to walk into your first class without any experience, then this is the workshop for you! Or, maybe you have already begun taking some classes but want to deepen your understanding and strengthen your foundation, then this is the workshop for you too! Come join us to define and improve your yoga practice, or begin your journey with the right tools. This two hour workshop teaches the basics of yoga in a welcoming and non-intimidating environment. Learn the importance of breath in your practice and how to flow with it, study basic yoga poses to build your yoga foundation, and acquire the knowledge of proper alignment to better improve body function and obtain long-term health goals. With hands-on assists, adjustments and cues for better posture along with a 20 minute Savasana (final relaxation pose) at the end of this workshop, you will feel right at home on your mat and will be able to enjoy a variety of yoga classes. Are you ready to take control of your health & wellness? You say you know what to do and how to get the results you're looking for, but do you really? If you knew what to do and how to do it, wouldn't you have already hit your health and wellness goals? Maybe you have all the knowledge, but it's just a matter of staying motivated and really making permanent, consistent changes. Britt's plan makes the process easier, not to mention a lot more fun because we do it in group. You'll learn how to bring balance and happiness to your life through nutrition, workouts, stress management, and time management. So sign up, get your group hug on, and let's get healthy following Britt's proven strategies for success. Recipes and Grocery Lists for Meal Prep Success! Body Composition Analysis giving you BMI, Fat %, Muscle %, and Visceral Fat. Weekly Webinars Covering Topics Critical to Your Success. Attend the informational meeting on Saturday, March 10th at Mueva at 11 am. Meeting will be videotaped if you cannot attend. This workshop is NOT for beginners, injured, or recovery individuals. It is also NOT recommended for pregnant or physically restricted persons. $20 Pre-registration - Until midnight, January 26th. $22 Day of or at the door. Please wear comfortable clothing, bring water for hydration and a yoga mat if you have one. Yoga mats can be rented for $1. Avoid a Santa belly this year by learning life hacks from Britt for surviving the Holiday season! Britt will be helping you stay fit and healthy during the holidays with this 7-week group! It will include a weigh in at the beginning and at the end for accountability as well as a 3-day cleanse to help you flush toxins and prepare your body for a clean and healthy environment the entire season. Britt will be teaching tips and tricks for immune boosting to prevent colds and flu’s, how to limit stress and focus on the joy, healthy swaps for your favorite holiday recipes, new to you seasonal, paleo recipes, healthy and guilt-free mocktails, virtual support in a Facebook group for recipe sharing and accountability, as well as a crazy fun holiday workout before Christmas! We hope you decide to join us for this amazing brand-new program! You must pre-register in order to attend the meeting. It’s better to avoid a workout, a heavy meal, and a large amount of water before the weigh in. Program runs from Nov 11th- Jan 2nd. A little bit of Kickboxing. A little bit of Zumba®. A whole lot of fun! Costume contest with the winner scoring a $50 Visa gift card. Plus we will have a 50/50 raffle and more! Don't miss the fun. $5 PRE-SALE OR AT THE DOOR. Party is limited to first 50 tricksters. Want to dramatically increase your chance of success in losing weight? Do it in a group! Losing weight with a group of motivated friends makes the process easier, not to mention a lot more fun. So sign up, get your group hug on, and lose weight following Britt's proven strategies for success. A Brown University study concluded that social networks and teamwork play a significant role in enhancing weight loss outcomes in weight loss interventions. In particular, the researchers found that having more social contacts trying to lose weight is connected with greater weight loss intentions, and that changes in physical activity are similar among teammates in a team-based physical activity campaign. Social dieting -- including elements like competition, team work & encouragement and, of course, gentle peer pressure (you don't want to screw things up for your team!) -- is a powerful and exciting weight loss tool. UNLIMITED MEMBERS - $99 for Mueva members who have an unlimited membership. Workouts are a required part of the 4 week program and you can use your current unlimited membership to fulfill this requirement. NON-MEMBERS - $199 for Mueva clients who have a punchcard or drop-in to classes. Unlimited workouts for the 4 week program are included with this option. Attend the informational meeting on Saturday, September 16th at Mueva at 11 am. Meeting will be videotaped if you cannot attend. Sign up in studio or on the Mindbody App. Don't miss this last one of the season. Want to dramatically increase your chance of success in losing weight? Do it in a group! 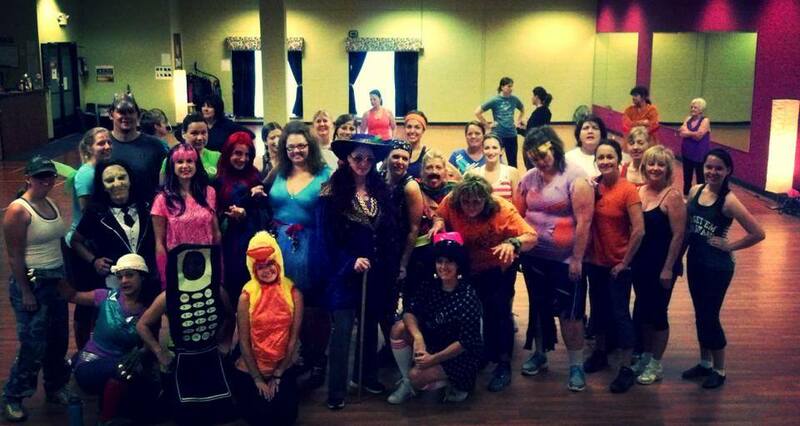 Losing weight with a group of motivated friends makes the process easier, not to mention a lot more fun. So sign up, get your group hug on, and lose weight following Britt and Amanda's proven strategies for success. Great Prizes including a Chance to EARN YOUR REGISTRATION FEE BACK! NON-MEMBERS/CLASS CARD HOLDERS - $199 for non-members and class card holders. The extra $$ is for unlimited group fitness. Class card holders will have their expiration dates for their class cards extended for 30 days. Attend the informational meeting on Saturday, April 22nd at Mueva at 11 am. Join us for FREE DEMO CLASSES all morning long! Pick and choose which classes you'd like to attend and show up. That's it. Join Barb Gilbert, Mueva yoga teacher and her sweetheart, Mark for 75 minutes of this playful and intimate class. This is an all-levels event and no prior yoga experience is necessary. Wine and sweets to follow. $40 per couple. Space is limited to first 20 couples who sign up. Bring two yoga mats (or rent for $1 each), wear comfortable clothing, and a water bottle. Click the picture and link to book your spot. Zumba Kids classes feature kid-friendly routines based on original Zumba choreography. We break down the steps, add games, activities, and cultural exploration elements into the class structure. 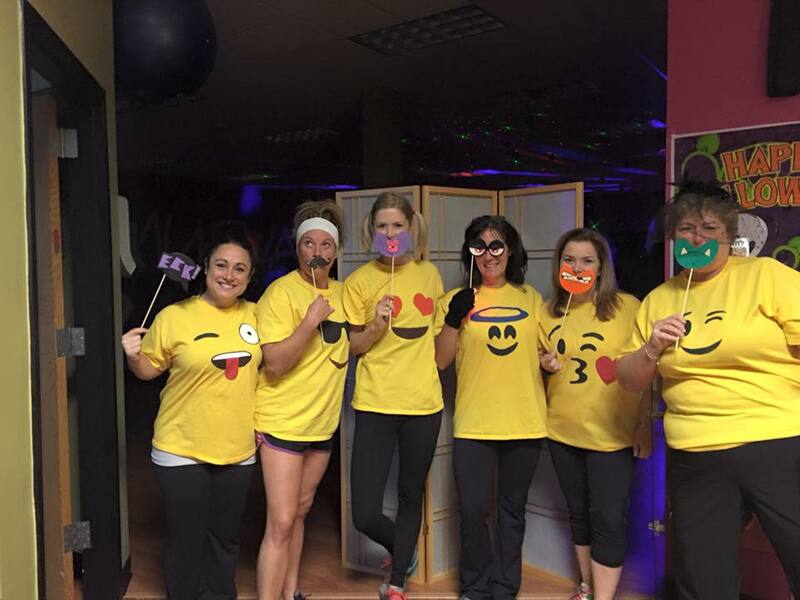 Zumba Kids helps develop a healthy lifestyle and incorporates fitness as a natural part of children's lives by making fitness fun. Miss Jen is a licensed Zumba Kids instructor and an elementary education teacher + she's a whole lotta fun! Our Family Fitness Saturdays are designed so that YOU get to workout while your child gets their groove on too! This weeks feature is: Power Pilates with Weights with Brittany. Cost: Kids - $5 if adult takes the class with Brittany; $8 if child is just dropped off.